Three billion bank accounts ended on August 29th, 2016. The survivors of the monetary collapse called it Judgment Day. They lived only to face a new nightmare: the War of the Billionaires. The cartel which controlled the money, Ca$hnet, sent several Terminators back through time. Their mission: to leverage the buyout of the remaining political system. The first Terminator had taken the form of Donald Trump, who quickly moved to consolidate power in the Republican Party. The second Terminator was known as Micheal Bloomberg, who sought disruption and control of the Democrats. By the time Terminators Gates, Zuckerberg, and Buffett showed up, the working republic which had struggled for decades was finished. A meditation on what isn’t there. I first heard of Michael Heizer in a sculpture class in college, sometime in the late 1970s. Well, that I remember. It’s entirely possible that I had seen some coverage of his work in the press before then. But my professor got me thinking about how sculpture defined space both by physical presence and absence, and I know that it was then that I became aware of Heizer’s work. I didn’t realize it at the time, but his basic concepts would manifest in my life in many ways, showing up in my interests in martial arts, book design, even writing. His ideas are incredibly simple, when you pare it all down to just its physical nature, it’s really quite simple, and you see it again and again in his work. To achieve that degree of simplicity is like, almost the hardest thing in the world to do. Not being there when your opponent strikes. Drawing the eye to the empty space. Allowing the reader to fill in the suggested, but missing, description. Each of these engages and enlightens in ways that no amount of force, or color, or detail ever could. Micheal Heizer makes you aware of space and your relationship to space and how you move through space,the role of the sky, the role of the land, beyond what you’re looking at. You have to rethink the nature of who you are physically in relation to what you are walking around inside and observing from a distance and up close. We’re not always aware of what we do while we’re doing it, or why. Sometimes, the trajectory of a life is determined by little things, subtle things. Even things which are mssing. Shortly after I had conceived of the idea behind Paint the Moon, I knew that it wasn’t actually feasible. But the idea delighted me. And after some thought, I realized why: it was taking the principles of Michael Heizer’s art — of paring down art to the very simplest, physical elements of experience — and going one step further. Remove the physical object altogether, and replace it with pure experience, pure concept. Hence my description of the project as a “collective lyric fantasy”. You can’t see the artifact of that project at a museum. There is no massive boulder to walk under, or a negative space in the desert to encounter. But there is the Moon overhead, and the memory of a moment in time. 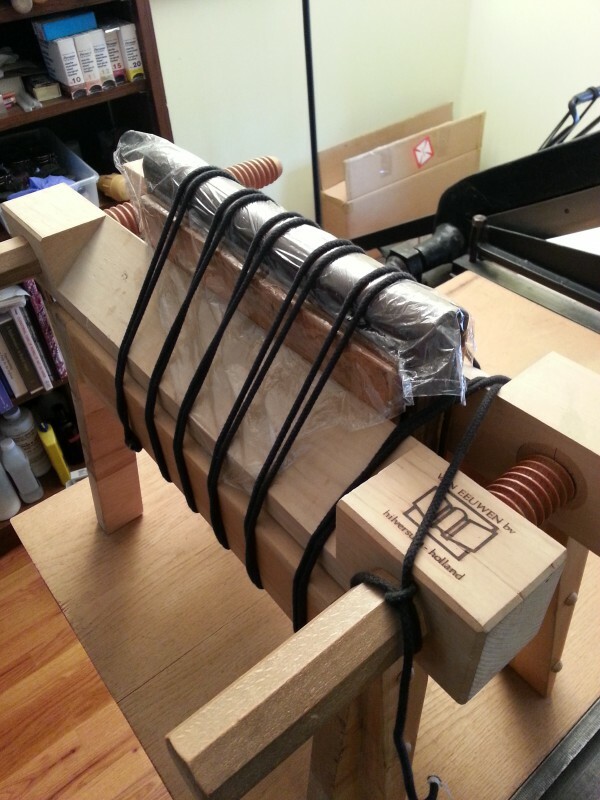 Fifty shades of … bookbinding? Sorry — saw this in the press this morning just after hearing an ad for the movie, and couldn’t resist. But I assure you that full consent was negotiated in advance. Why catch-up? Well, this might explain why I took a break for a while there. First thing, thanks to all who downloaded Communion of Dreams over the weekend, or helped to spread the word about it. There were a total of 693 downloads worldwide — and that includes various European portals, as well as Canada, India, and Japan! Pretty cool. For those who have gotten the book, once you have a chance to read it please take a few moments to review it on Amazon or elsewhere – it really does help, and as I am finishing up writing St Cybi’s Well the feedback is most welcome. Petre Ifan is a haunting burial stack that stands in a verdant Welsh field as one of the most complete and dramatic stone dolmens still found anywhere on the planet. Go see the full size image and explanation of the science. Worth it. See? I’m actually making you SMARTER! Keep that in mind when you write a review, will ya? And that’s enough for now. I need to get back to my “strange and solitary activity”.